Immerse yourself in the natural beauty of Southern California at Marriott's Newport Coast Villas. Set on a bluff overlooking the Pacific, our premium vacation ownership resort sets the stage for a memorable visit. Stylishly appointed, two-bedroom villa rentals offer amenities like full kitchens, complimentary Wi-Fi access, washer/dryers and private balconies or terraces. There are plenty of wonderful activities to keep you occupied - from three outdoor pools and a modern fitness center, tennis and basketball courts and even an on-site putting green. Rent a bike and explore Newport Coast on two wheels, plan a barbecue in the picnic area or gather around the fire pit in the evening and toast another successful day. Spoil yourself with a massage at the spa, or enjoy an al fresco meal at La Vista Pool Bar & Grill. If you're in the mood to explore, our rentals offer hassle-free access to Balboa Island, Fashion Island and Knott's Berry Farm. 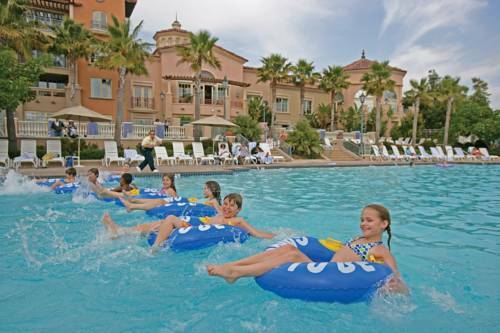 Plan your vacation today at Marriott's Newport Coast Villas. La Vista Pool Bar & Grill: Located poolside, La Vista Pool Bar & Grill offers modern American fare and a superb cocktail list. This vibrant restaurant is open for lunch and dinner; join us for a delicious meal and enjoy the Newport Beach weather. The Marketplace: Those on the go in Newport Coast will appreciate our convenient Marketplace - perfect for picking up a snack or a drink if you don't have time for a restaurant-style meal. The Marketplace also offers Starbucks coffee and other necessities.